Tuff-Writer manufactures quality precision pens for everyday use but they are built tough to provide solid impact for self-defense situations. However, all models of pens are just that - pens - without the proper knowledge and training on the tactics required to use a tactical pen. Michael Janich, founder of Martial Blade Concepts, is an excellent instructor and utilizes techniques that almost everyone can pick up quickly. 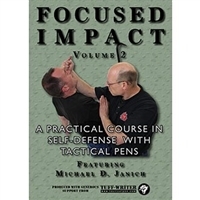 Explore the DVD options and find out how you too can be prepared to use a tactical pen for self protection.